Lil' Bits "Lovin' Life" lets the good times and creative options keep rolling!! Wonderfully designed journal cards, flower clusters and several digital sentiment stamps give you so many more creative options when designing your scrapbook layouts, cards and mini albums....you will be "Lovin'" your imaginative journey!! 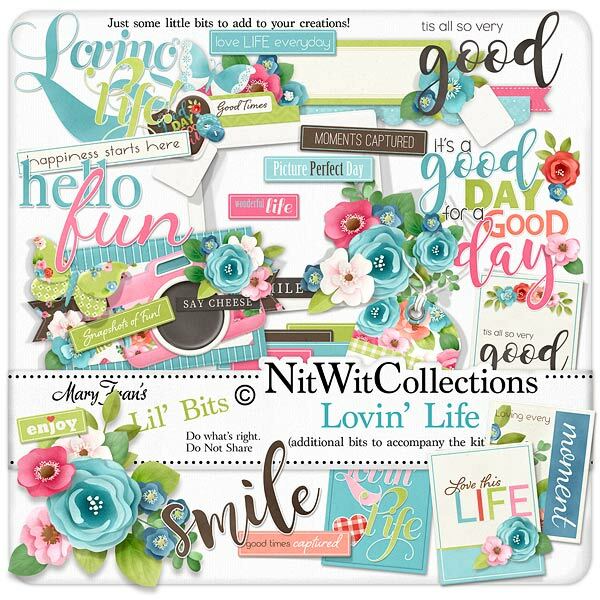 Don't miss out on these digital elements as they are not included in the FQB "Lovin' Life" Collection so please don't miss out on owning and creating with these elements! 1 Journal card - "Love this Life"
1 Elegant journal card with floral accents - "Loving every Moment"
1 Journal card - "Lovin' Life"
1 Simple and succinct journal card - "Tis all so very Good"
1 Sentiment stamp - "Tis all so very Good"
1 Sentiment stamp - "It's a Good Day..."
1 Sentiment stamp - "Hello Fun"
1 Sentiment stamp - "Loving Life"
1 Sentiment stamp - "Smile"
1 Title cluster - "Snapshots of Fun"
5 Blank wordstrips for you to fill in with your ideal sentiment, name, date, title, etc.